A medieval barn described by the poet John Betjeman as the ‘cathedral of Middlesex’ has been rescued from decay and neglect for the nation, English Heritage said today. Grade I-listed Harmondsworth Barn in west London joins the likes of Stonehenge, Osborne House and parts of Hadrian’s Wall in the national collection of historic sites and monuments under the guardianship of English Heritage. The structure resembles the nave of a large church, standing at nearly 60 metres (200ft) long, 12 metres (40ft) wide, and 11 metres (36ft) high, with 13 huge oak trusses resting on stone blocks holding up the roof. While it has had some repairs over the years, most recently by English Heritage to make it weather-proof and keep out pigeons, the structure is largely as it was built, with the timber and stones still bearing original carpenter and mason marks. It is thought the purchase by a Gibraltar-based company for £1 was a speculative one, as the barn stands just metres from where Heathrow’s third runway – had it gone ahead – would have been built. In 2009, English Heritage became concerned about the barn’s deteriorating condition and issued an urgent works notice for emergency repairs to keep it water and wind-tight. A dispute over payment for the emergency works led to English Heritage buying the barn, which lies between the M25 and M4 motorways, for £20,000. The barn’s precarious state was publicised in 2009 when building-preservation journal Cornerstone published an article on the gaping holes and disrepair. Michael Dunn, historic buildings inspector for English Heritage, said the building was the best preserved and largest surviving medieval timber barn in England, probably in Europe. ‘This is high status, this is the finest timber, and a very confident carpenter. This is as good as it gets,’ he said. 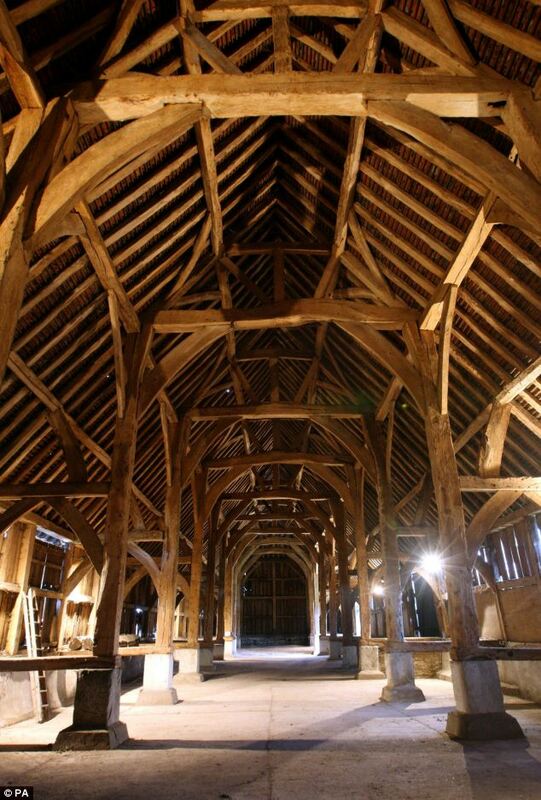 Simon Thurley, chief executive of English Heritage, said: ‘Harmondsworth Barn is one of the greatest medieval buildings in Britain, built by the same skilled carpenters who worked on our magnificent medieval cathedrals. ‘Its rescue is at the heart of what English Heritage does – protecting this nation’s architectural treasures and helping people discover our national story through them. A local group, the Friends of the Great Barn at Harmondsworth, formed around six years ago and have been dedicated to preserving the building, researching its history and keeping up the interest in its future, opening it each year to around 400-500 visitors during the Open House weekend. The barn will now be open for free two Sundays a month between April and October, staffed by volunteers, with plans to open it every Sunday from next year. London reported a surge in bookings for the week of Prince William and Kate Middleton’s marriage. Today marks just 100 days until the ­ceremony takes place at Westminster Abbey on April 29. Amid growing excitement in Britain and abroad, William and Kate marked the countdown by putting the final touches to a list of around 1,800 people they want to invite to the service. The couple have been overseeing plans for their big day from their isolated farmhouse in North Wales, travelling to London whenever their schedule has allowed it to sit in on regular meetings with courtiers. The Prince is currently serving as an RAF helicopter pilot in Anglesey. One senior aide said yesterday: “They’re both very happy and very excited about it all. It’s not long now. There’s a lot of work to do but they’re doing it in between Prince William’s flying and Catherine’s other commitments. Many of the key issues, such as the names of the bridesmaids, page boys, the wedding dress designer and its basic design, have already been hammered out in secret. Kate made a final decision about her choice of designer last week from a small shortlist, according to royal sources. A stag party venue has been agreed and, despite reports that it will take place in Cape Town, sources close to William have hinted that it will be in Britain or western Europe. 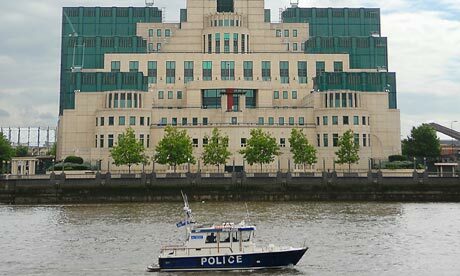 When MI6 set up home on the banks of the Thames one secret escaped its watchful eyes. The oldest wooden structure ever found on the river, timbers almost 7,000 years old, have been discovered buried in the silt below the windows of the security services’ ziggurat headquarters at Vauxhall, south London. “They accepted there wasn’t much damage we could do with a tripod,” said Gustave Milne, the archaeologist who leads the Thames Discovery programme that has been surveying the entire prehistoric foreshore, uncovering centuries of ancient wharves, fish traps, jetties and ship timbers. “The find is very interesting, because in the mesolithic period the people were nomadic hunter-gatherers, living in temporary camps – not at all given to building substantial structures like this,” Milne said. 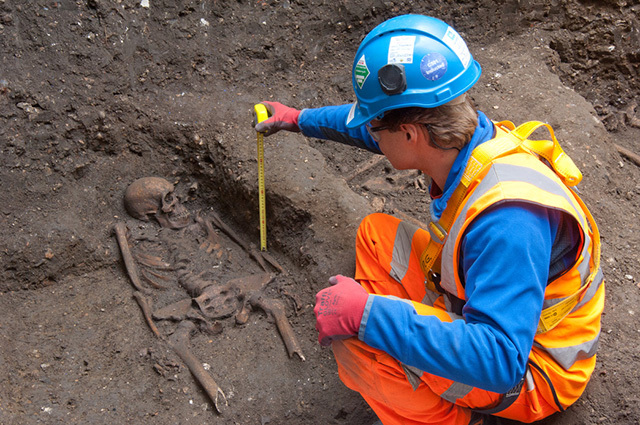 “There may have been a ford, it may have had some religious significance, or it may just have been very rich hunting grounds – but it was clearly what my colleague at the Museum of London calls ‘a memorable place’,” Milne said. Tickets to watch the 2012 Olympic Games will be among the most expensive in British sporting history, it’s been revealed. Sports fans will pay as much as £2,012 for the best seats at the opening ceremony, while the same seats at the closing ceremony will cost £1,500. The most expensive sport will be the athletics, to be held at the new 80,000-seat Olympic Stadium. A coveted ticket to the men’s 100m final will cost as much as £725 – the equivalent of £76 a second based on Usain Bolt’s world record. Beach volleyball, gymnastics, diving and swimming will also be among the most expensive finals to watch, at £450 for the best seats, with the basketball finals close behind at £425. The prices – which exclude corporate tickets – easily exceed those charged for the finals of the FA Cup, Wimbledon tennis and Premier League football matches. There are 26 Olympic sports but 39 disciplines in total. There will be 302 medal events and 649 sessions of sport to watch. The price will vary according to the event. Each event will have different ticket prices, ranging from £20 to £725. Organisers say 90 per cent will cost £100 or less, two-thirds will be £50 or less and 30 per cent £20 or less. There will also be 11 free ticket sessions for sports such as triathlon, the marathon, race walking, road cycling and sailing. Yes, for around 220 sessions and 1.3 million tickets. Children 16 and under on July 27 2012 will pay their age. Those 60 and older on the same date will play a flat £16. This offer will not include tickets for any final but will cover every sport. Wheelchair prices include a companion seat. Children will also be able to go along thanks to a ticket share scheme. 50,000 tickets have gone to the London Mayor, 50,000 to the Government and 25,000 to sporting bodies. The Mayor’s tickets will go to children in London, the Government’s to secondary schools around the UK. However, games organiser Locog insisted taxpayers had not been priced out of the event they had funded and said 90 per cent of tickets would cost £100 or less. A third of tickets will cost £20 or under, with Olympic chiefs unable to keep their promise that they would sell half of tickets at this price. Some 1.3million tickets will be reserved at special prices for children and people over 60. Under the ‘pay your age’ scheme, 10-year-olds will pay £10, 11-year-olds £11 and so on. Those over 60 will pay a flat £16. Event bosses face pressure to make £400million from ticket sales, while ensuring that the 26 sports remain affordable and that the stadiums are full – avoiding a repeat of the near-empty stadiums at some of the Commonwealth Games events in India this month. Events such as the marathon, cycling road race and time trial and triathlon will be free because they are on public roads, although grandstands at the finish area will be ticketed. The cheapest events include the shooting finals with a top price of £40, sailing at £55 and the modern pentathlon at £75. 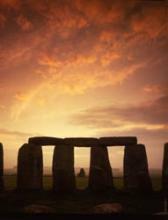 There are 8.8million tickets available, with 6.6million of these available to the public from March 2011. The rest will go to broadcasters, sponsors and the 204 overseas Olympic committees. Some 1.7million people have registered on the london2012.com website, which will guide them in applying for tickets for the 26 sports, split into 649 sessions. The Government wants each school in Britain to receive six free tickets, but London Mayor Boris Johnson is trying to find sponsorship for a further 75,000 to be given to London pupils so one in eight can attend the Games. Make your tour plans well in advance. 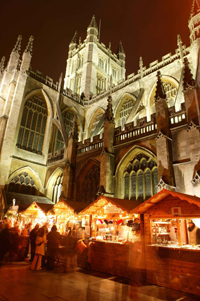 Escape the city for a day and join a private guided sightseeing tour. Contact us in advance for any travel arrangements you may need.